Disgraced former Presidential guard Mike Banning finds himself trapped inside the White House in the wake of a terrorist attack; using his inside knowledge, Banning works with national security to rescue the President from his kidnappers. 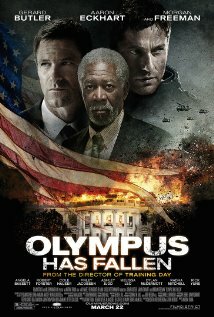 When the White House (Secret Service Code: "Olympus") is captured by a terrorist mastermind and the President is kidnapped, disgraced former Presidential guard Mike Banning finds himself trapped within the building. As our national security team scrambles to respond, they are forced to rely on Banning's inside knowledge to help retake the White House, save the President and avert an even bigger disaster. Taglines: When our flag falls our nation will rise. What "Die Hard 5" should have been. I find it ironic that Gerard Butler, a Scotsman, as disgraced Secret Agent Mike Banning, embodies the spirit of John McClane much more than Bruce Willis did in that last dreadful outing. If anything, Butler has done nothing more than to cement his reputation as a bankable and likable action hero for the new generation in this old-school action movie. He has a commanding presence on-screen, quips wisecracks, bleeds when it's crucial, and dispatches the bad guys in a methodical cross between Jason Bourne and John Rambo. Not even the fine supporting cast (Morgan Freeman, Aaron Eckhart, Angela Bassett, Robert Forster, Melissa Leo, Dylan McDermott) can take away Butler's limelight. Indeed, Antoine Fuqua's "Olympus Has Fallen" is not only terrific entertainment but a terrific throwback to the pivotal 90's action movie, the Die Hard clone - and this film ("Die Hard" in the White House) is another reminder of why the trusted formula works, even if it has been dormant for nearly two decades (the last good big one being Peter Hyams' "Sudden Death"). From the moment the film's main action start, the film doesn't stop running. The bad guys, hoo boy do they mean business. Rarely, if at all, have I seen this much brutal collateral damage in an American action film. Americans citizens get mowed down by bullets from ground and air forces. The all-American (Scottish) hero represents freedom and justice, and the bad guys represent every American's worst nightmare. I haven't seen this much political incorrectness since "The Delta Force". Having said that, Rick Yune surprisingly makes for an effective and nasty villain, who is relentlessly cold, smug and procedural in his mission, following the formula perfectly. If it ain't broke, don't fix it. Fuqua is no stranger to action, having helmed the solid "Shooter" six years ago. Here he ratchets up the action up to a 10 (CGI is present but used reasonably), and he remarkably doesn't hold back on the tension. It's no "Training Day", but it more or less hearkens back to an Antoine Fuqua who made "The Replacement Killers". Just thrilling fun. Of course the plot isn't original. It's a genre picture, and what I pay to see in a genre picture is its skillful craft and cohesive plot. This film has both, and resurrects the Die Hard clone from the grave. Here I thought I was getting bored of action movies. The genre is dying, you say? Here's a solid kicker.